What is the difference between API and intermediate? Home/What is the difference between API and intermediate? Our chemical products include vitamin, disperse dye, color former, curing agent, etc. So what is intermediate? What is the difference between it and API? Intermediate is also called organic intermediate. Coal tar or petroleum products are used as raw materials to produce intermediate products of dyes, pesticides, pharmaceuticals, resins, additives, plasticizers, etc. Because it was originally used to make dyes, intermediate is also called dye intermediate. It is formed by reactions (sulfonation, alkali fusion, nitrification, reduction, etc.) of cyclic compounds (such as benzene, naphthalene, anthracene, etc.). Initially, intermediates were produced from coal tar or petroleum products in the process of synthesizing perfumes, dyes, resins, drugs, plasticizers, rubber accelerators and other chemical products. Now they refer to various intermediates produced in organic synthesis. Intermediates refer to semi-finished products, is the intermediate products of certain products. For example, to produce a product, it can be produced from intermediates to save costs. Drug production requires a large number of special chemicals, most of them were originally produced by the pharmaceutical industry, but with the deepening of social labor division and the progress of production technology, the pharmaceutical industry will transfer the production of some pharmaceutical intermediates to chemical enterprises. Pharmaceutical intermediates are fine chemical products. The production of pharmaceutical intermediates has become a major industry in the international chemical industry. Intermediate is a kind of material produced in the process of API, which can only be turned into API by further molecular change or refinement. Intermediates can be separated or not separated. API is Active Pharmaceutical Ingredients. 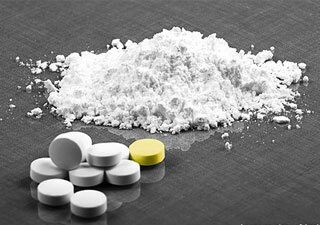 Any mixture of substances or substances intended for use in pharmaceutical manufacture. It is also an active ingredient in pharmaceuticals when used in pharmaceuticals. Such substances have pharmacological or other direct effects in the diagnosis, treatment, remission, treatment or prevention of diseases, or can affect the function and structure of the body. From the definition, it can be seen that the intermediate is the key product of the preceding process of making API, which is different from the structure of API. In addition, pharmacopoeia is available for the detection of API, but there is no intermediate.